This Watch Is iN Excellent Condition For A Watch That Has Been Previously Enjoyed. Please Refer To The Pictures iN Determining The Condition, Pictures Are Of The Exact Watch Being Offered. The Case Is Stainless Steel With Mixed Brush And High Polish Finishes. The Crystal Is Scratch-Resistant Sapphire. The Case Back Is Solid Stainless Steel. Dial Is Silver With Index Hour Markers And Red Subdials. The Date Window is Located At The 4:30 Position. The Hands Are Luminescent-Filled Stainless Steel, And The Outer Minute Track Is Bordered By A Tachymetric Scale. 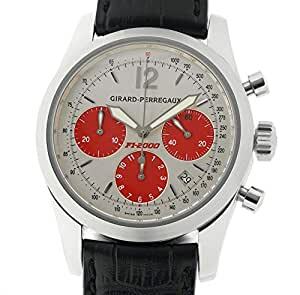 Currently Mounted On The Watch Is A New Generic Black Alligator Skin Strap Which Is Attached To A Girard Perregaux Stainless Steel Tang Buckle. A Full One Year Warranty And Certificate Of Authenticity Will Be Issued By Element iN Time NYC.. Buy with confidence knowing each timepiece goes through the same rigorous 31-point inspection. Rest assured only authentic parts straight from the manufacturer are used. The Certified Pre-Owned Program on Amazon ensures peace of mind and transparency via standardized reports and a 1 Year Warranty Provided by WatchFacts.